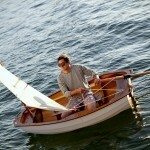 Who doesn’t like boats? But lets face it: not everyone has a vehicle that is capable of towing a 27-foot boat to the shore, much less afford the maintenance that comes with a full-fledged boat. 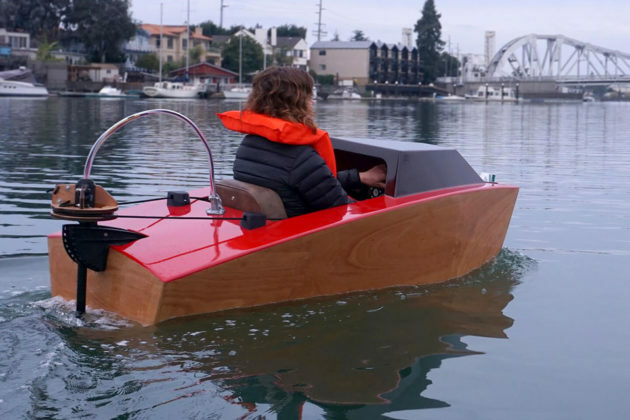 At this point, you could either make peace with your desire to own a motor boat by going with kayaks, which are more transportation-friendly, or you could look to this super fun, super cute Rapid Whale Mini Boat Kit. Inspired by a number of boats, including Paul Elkin’s 8’ “Little Miss Sally” and American Boathead’s 8’ “Model C,” Rapid Whale Mini Boat Kit is a fully-functional 6 foot long electric-powered boat that looks like something pulled straight out of a fantasy world. 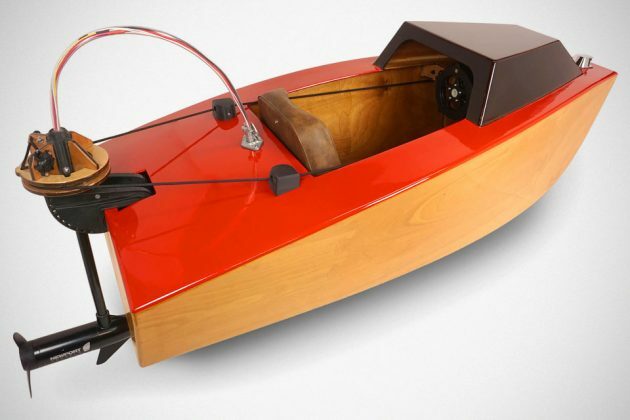 Perhaps the most brilliant part about this strangely alluring tiny watercraft is the simple build, involving interlocking assembly, cable-tie and epoxy construction. 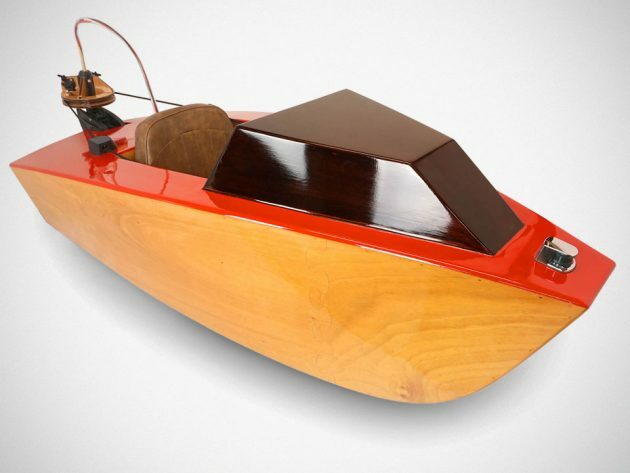 Not withstanding its diminutive size, it still boasts precision marine-grade plywood and internal bulkheads that serve as flotation in the event of flooding. Other highlights include deadman switch, front light, thick plexiglass steering wheel, reliable steering geometry, electric trolling motor propulsion, a throttle with 5 forward and 3 reverse speeds, low and comfortable seating position, stable flat bottom hull design, and it even has storage which can found above the dash and behind the seat. When put together, Rapid Whale Mini Boat measures 72 inches (1.8 meters) long, 31 inches (0.8 meter) wide, stands 24 inches (0.6 meter) tall, and weights just 67 lbs (30 kilograms) boat-only, or 105 lbs (48 kilograms) when outfitted with the motor and battery system. It is designed to support a person of up to 6’ 2” (1.83 meters) tall and up to 200 lbs (91 kilograms). Specifics of the trolling motor is not offered, but it is said that the propulsion enables this adorable boat a brisk 3.5 knots (equivalent to 4 mph or 6.4 km/h). You will not cut through the chops like real speedboats do, nor it is as intimidating as the Black Pearl, but I imagine it will be extremely fun to captain your own boat. 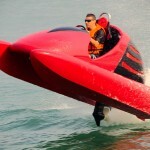 Rapid Whale Mini Boat Kit is offered as a kit and it is surprisingly affordable at $950 plus tax and shipping. 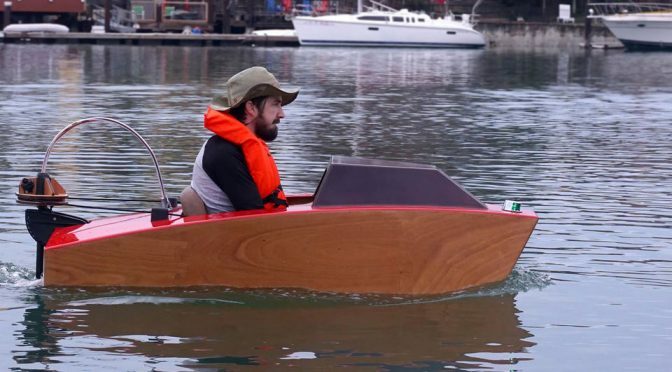 However, if you rather DIY one yourself, by acquiring the plans for $100 per boat, or if you think you have what it takes, you can also choose to follow its creator, Joshua Tulberg, instructions posted on Instructables. Whichever route you choose, Captain getup remains entirely optional. 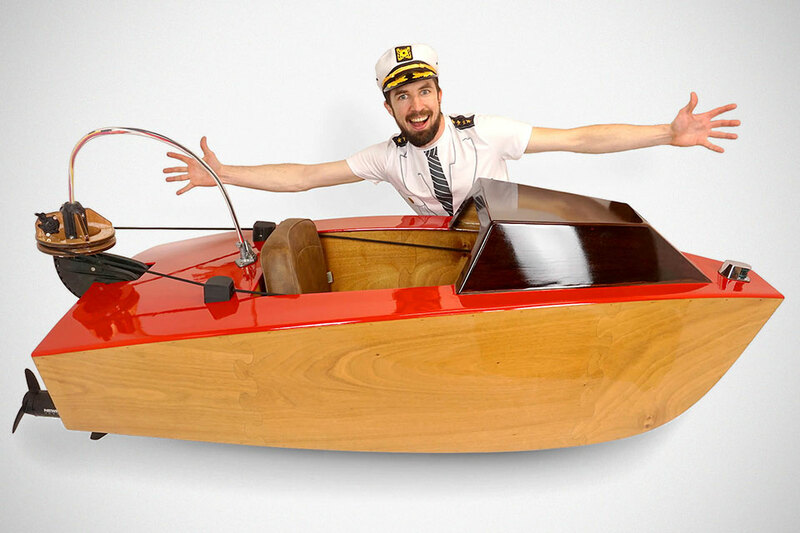 However, it will look absolutely cool to be commandeering this cute boat on your local lake in a faux Captain outfit. Catch this super cute’s first launch in the video below. Images courtesy of Rapid Whale.